I hope everyone had a wonderful Christmas, Hanukkah, or whichever celebration you participated in! I got spoiled with wonderful gifts, including the fantastic autobiography of Kristin Chenoweth, called A Little Bit Wicked. I loved the book so much, I read it in two days. It's well written, funny, informative, good-hearted and genuine. I strongly recommend it to anyone who has an interest in Broadway, theatre, singing, tv, acting, and of course Kristin Chenoweth. Just in case you already have years of reading to catch up on, here is her advice for young actors, taken straight from her book. "It's been said a thousand times, and it's true: if there's anything else you could be happy doing, you should do it. Run with the big dogs or stay on the porch with the puppies, but let your ambition be about who you want to be, not what you want to get. Awards are on the outside. Rewards are on the inside. That means rewards don't have to be dusted. Never, never forget the fun factor." Besides reading this book, I also got the chance to see the Radio City Christmas Spectacular this morning (it was an unlisted 9am performance, and I am curious how that worked with the union). a 3D video where I felt like I was flying in the sky with Santa. not one, not two, but three camels (CAMELS!) nonchalantly walking by on stage. some aerial actions (which did bring to mind the recent Spiderman fall, and made me wonder if any actor on Broadway doing aerial stuff is also thinking about it every time they do it). 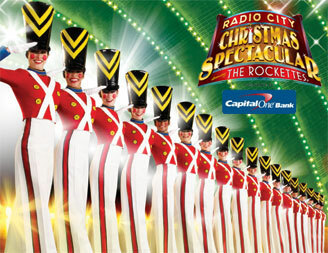 a cool number of the Rockettes dressed in military uniforms creating interesting visual effects (which made my military husband say that the Rockettes would be really good at marching, and made me wonder if the military would be good at being Rockettes)! This was the kind of show that reminded me why I do what I do, and made me proud of being a part of the theatre world. 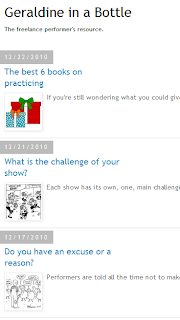 Last on my list of things that made me happy this Christmas is that my blog is now published for easy read on your mobile phone! You've got nothing to do but type the web address on your phone and voila! Make sure to try it out! Now, back to eating yummy leftovers (which include an amazing vanilla and berries Buche de Noel), and cozying it up by the fire! I wish you just the same! Sounds like you’re having a wonderful Christmas, I’m glad:-) I’ll be sure to check out that book. Merry Christmas and happy new years! Hi Kez! After reading her book, I love her even more than I did before! She's so funny and humble, her book is really inspiring. Let me know what you think of it when you read it. Do you have fun with your instrument? 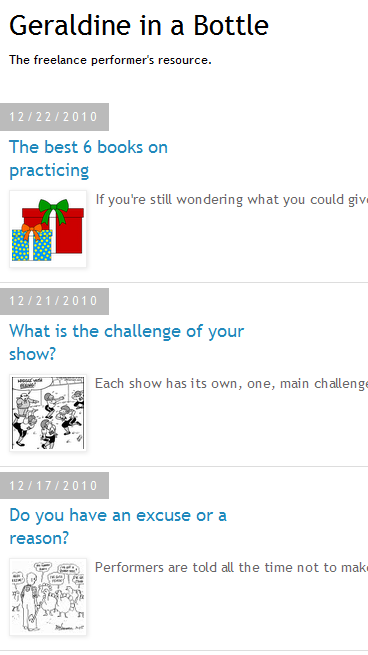 What is the challenge of your show? Do you have an excuse or a reason? Are you a show or a no-show? Do you play with your fingers or with your brain? Who is in charge of the tempo here? Are you a rehearsal backseat driver? Are you using your knowledge right?